Kuala Lampur, Malaysia – AFA Report #2 and a Message from Aoi Yuuki! Anime Festival Asia in Malaysia! 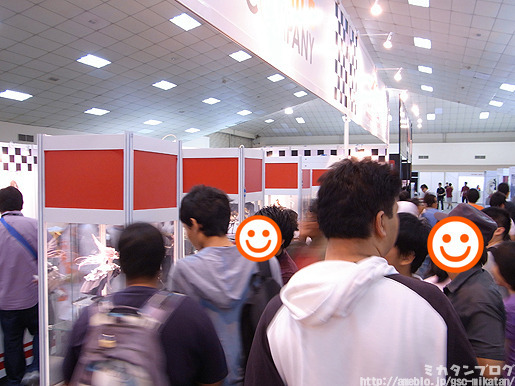 GSC had a booth there on the 9th and 10th of June! This is how the GSC booth looked! We had displays of upcoming products which loads of people came by to look at! I was so glad to see that anime and figure culture has spread so much all over Asia now! This is the backstage area! The audience area was huge!! I guess for celebrities and musicians this is quite normal, but for me it was amazing to see so many people! Thanks Malaysia!! MAX Watanabe and Aki were both on stage with Danny Choo! Danny would translate everything that MAX and Aki would say so that everyone in the audience could understand! Thanks Danny! During the talks a number of figures would be put up on the monitors and the audience would all cheer together – it was incredible!! Today was also the day of the preliminary races taking place in Sepang, Malaysia – in which the Miku car was racing. Kaula Lampur and Sepang are about one hour apart by car, so Aki actually came from the race to be here for the stage performance! MAX and Aki definitely chatted with a number of customers, but even I got some customers that came and told me things like, “I love reading your blog” or “Looking forward to the next blog!” which made me really glad! Everyone in Malaysia was really kind, and most would try hard to speak to me in Japanese as I can’t speak English at all – it really meant a lot to me! Now that I’ve seen how many people are looking forward to GSC’s products even outside of Japan, I’m definitely going to work as best I can to show the best products to everyone!! That brings my AFA report to and end! I’m sure it wasn’t the best event report ever, but I hope you enjoyed it! It’s not easy to get to an event like this if you don’t live around Malaysia, but I hope you were at least able to get a feeling for the event from my report! The thing that really leaves an impression on me from this event is that even though the event hall was always in chaos, people wanting to take photos would always patiently wait their turn and if someone just slightly bumped into you they would apologise – I think that considerate mindset is absolutely wonderful. It was my very first visit to Malaysia, and I’ve come to love it! If I ever get the chance I will definitely be back. A big thank you to everyone who came by the booth at the event, as well as to everyone who came to speak with me!! The main display at AFA – Ultimate Madoka! Normally there are two prototypes created of any figure – one more promotional use and another to be sent through to the factories in China for manufacturing. But this time around we only had the one and it needed to be displayed once in Japan and then again in Malaysia, and now it’ll only be sent to China! The picture above came out a little bit blurred because of the display case glass, but somehow I quite like the way it came out anyway – it actually looks quite pretty! Aoi Yuuki, Madoka’s voice actor!! Look at the picture above and imagine Madoka’s voice saying the following! I absolutely love the skirt with the universe inside it! Not to mention the beauty of those transparent wings! Just seeing how divine she came out makes me want to kneel down and praise the creators!! To think that Madoka’s final form will be delivered to so many people looking this wonderful makes me incredibly happy!! If you haven’t preordered your’s yet, be sure not to miss out!